Our threat hunters identify stealthy malicious programs that are designed to compromise systems and exfiltrate your data. We’ll also identify attacker tactics that don’t rely upon malware, but instead use “living-off-the-land” tactics, like leveraging stolen credentials to traverse your environment and steal proprietary data. We combine industry-leading network and endpoint detection with advanced threat hunting to identify active or recent security breaches in your environment. Our program has earned the National Security Agency’s Certified Incident Response Assistance accreditation. Technology Deployment and Preparedness We deploy full-packet capture network detection and endpoint threat-hunting agents to provide comprehensive threat visibility. Threat Identification and Discovery We identify the presence of active attackers, artifacts from recent attacks, data exfiltration, and any suspicious behavior. Our threat hunters monitor activity across endpoints to accurately and quickly detect suspicious activity. In the event of a compromise, we’ll notify your organization to ensure you have the information necessary to act quickly and effectively. Actionable Recommendations We provide a detailed report outlining the compromise assessment process and key findings including any evidence of breach. Our specific recommendations address any active or recent compromises to ensure you’re protected and better prepared moving forward. Booz Allen’s threat hunters locate and remediate threats that can evade traditional security technologies on your network and endpoints. We combine your logs and existing detection capabilities, along with proprietary Booz Allen capabilities to support our battle-tested methodologies—uncovering even the most difficult-to-locate cyber threats. The length of a compromise assessment depends on an organization's size and complexity. In most cases our analysts complete the assessment in 8 weeks. (1) Booz Allen threat hunters will monitor activity across endpoints to accurately and quickly detect suspicious activity. 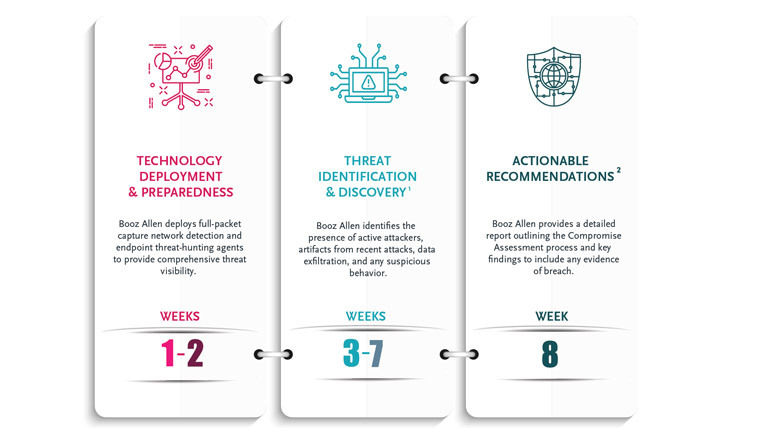 In the event of a compromise, Booz Allen will notify your organization to ensure you have all of the information necessary to act quickly and effectively; (2) Booz Allen will provide your organization with specific recommendations to address any active or recent compromise and ensure you are protected moving forward.